Coincidentally, the first time I came to Greece in 1992, it was the week after Easter. It must have been Thursday. The "odyssey" of my trip was about to end, and Kalambaka was a temporary stop before Thessaloniki, initially, with a final destination in Drama. Arriving at the foot of Meteora, and after a week hiking with a backpack, there were left only memories of food and an empty Coke bottle. Hunger, fatigue and insomnia claimed equally the total dedication of my mind, with final triumph being the first. Bravely and with the little Greek I knew, like an "old" immigrant, my older brother and I approached the first house we encountered. Soon we emerged with two bags of Easter dishes. It would be inaccurate if I did not speak of the great surprise that I tasted. Even if that hunger did not provide the luxury of a traditional and historical approach to food, some things left you anything other than indifferent. 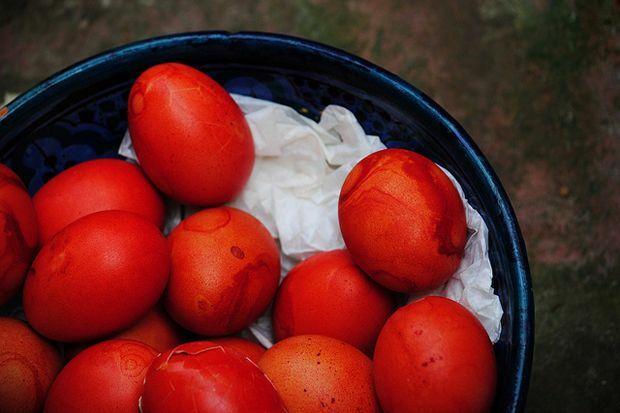 The colored eggs, however, were a special surprise. It was at such a level, that at one point I wondered if the chickens on this side of the border laid them completely red. The vision of the pears and other summer fruits in the heart of Spring, were both majestic and hearty. If you think about the fact that in the village we waited till August to try them, being without the importing of "capitalist products", there is no explanation. From 1969, when Enver Hoxha proclaimed Albania an atheistic land, tearing down religious churches as "medieval ruins", and imprisoning or humiliating religious workers of all faiths, as "instruments of the enemies of the revolution" - by implication he abolished religious celebrations and abolished traditions. The few who insisted on remembering them did so silently, risking imprisonment even if "the party" found shells of colored eggs in the garbage. Others were convinced by Marxism that "religion is the opium of the people". For a better understanding, even Hoxha stated that "if there is a God, let him come down and punish me". And since nothing happened in the hall, he became believable to many. Even though no one spoke to us about the religious custom, and it was hunger that "introduced" us to her, this can be described as the first Easter of an atheist, who would later learn that faith for people is a fundamental right. It is an expression of freedom and must be recognized for everyone, regardless of ideology, origin, or color. Niko Ago is an Albanian and has worked for many years as a journalist in Greece. He now lives in Sweden.